The sleek glass, metal and warm wood design of the Park Hyatt Washington is the ideal setting for WLâ€™s modern bridal gowns of Spring/ Summer 2007. 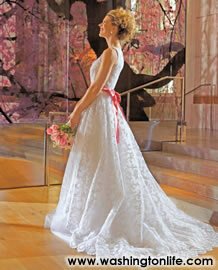 Our selections are romantic yet confident looks that speak to the contemporary Washington woman. New this season: softer dresses in slip and empire shapes that add airiness, ruching and draping for subtle body consciousness and the continuation of intricately beaded accents, insets and overlays. As a counterpoint to the modern gowns, reach back for vintage and estate jewelry inspiration and add the boldness of innovative floral design.In all, go for a modern romance. PLATINUM COLLECTION strapless silk gown with embroidered bodice, waist detail and beaded tulle skirt, $4,800, CARINEâ€™S; antique platinum pavÃ© diamond drop earrings, $8,100, round and marquise diamond necklace, $35,000, and 5.6 k diamond ring in platinum setting, $57,500 all by BOONE AND SONS; Chantel head piece, $195, TROUSSEAU; MOYNA COUTURE beaded wrist-cord handbag, $265, HARRIET KASSMAN; bouquet of jade green roses, hydrangea, cymbidium and black calla lilies. ALVIN THOMPSON custom-designed black and white Dupionni silk under-dress, and over-skirt of silk and embroidered tulle, silk bow, and hand-embroidered rose appliquÃ©d veil, $6,000, for NEW COUTURE; round diamond and Rose cut diamond drop earrings, $4,950; pavÃ© diamond Rose bracelet, $9,450; Asscher cut diamond ring and micro-pave diamond setting, $15,500, all BOONE & SONS; Biedimere-style bouquet of white Ranuculus and black Bicari roses with black feather trim. ULLAMAI-JAI ivory silk charmeuse bias gown with Swarovski crystal accent, $2,900, HITCHED; vintage pearl, platinum and diamond earrings, $11,500, vintage necklace of pearls, platinum, and diamonds, $27,000, vintage platinum and diamond bracelet, price upon request, and Asscher cut diamond set in platinum, price upon request, all by TINY JEWEL BOX; EDIDI metallic evening bag, $3,173, SAKS FIFTH AVENUE. MELISSA SWEET short white silk taffeta and tulle dress, $2,200, CARINE'S; white satin gloves, $95, and GENIE custom tiara headpiece, $250, both by TROUSSEAU; white gold and diamond earrings, $7,765, and white gold and diamond pendant necklace, $7,280, both by TINY JEWEL BOX; whimsical bouquet of daisies, Memoi, white Ranuculus, and Billy Balls by KELLY FOR CAPITAL DÃ‰COR AND EVENTS. ADELE WECHSLER ivory organza gown with peau de sois lattice ribbon and flower trim, $3,470, CLAIRE DRATCH; platinum, yellow diamond and white diamond earrings, $59,625, platinum, yellow diamond, and white diamond necklace, $59,000, platinum and diamond ring, $60,000, and vintage platinum and diamond bracelet, price upon request, all by TINY JEWEL BOX; white orchids as hair ornament and matching table dÃ©cor by KELLY FOR CAPITAL DÃ‰COR AND EVENTS. OSCAR DE LA RENTA white handcut embroidered taffeta on tulle ball gown with pink taffeta sash, $9,430, HITCHED; three stone platinum ring 1.56 k, $19,375, and cluster diamond earrings, $19,500, both by PAMPILLONIA; bouquet of pink Vandyke tulips, pink Ranuculus and white lilacs.